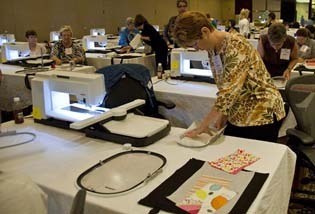 Having fun at a BERNINA 830LE VIP Retreat this summer – and there are more VIP Retreat weekends coming up this winter! We created an adorable tote using the BERNINA CutWork Tool and the “Floralicious” design collection! If you’ve purchased an 830LE this an event you don’t want to miss! Surround yourself with all things sewing and embroidery for 2½ days of sewing fun with BERNINA Educators and sewing enthusiasts! 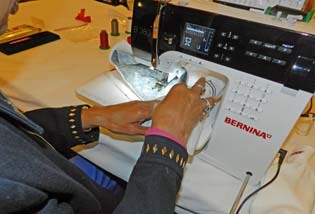 For more information visit www.bernina8series.com. I think it is an injustice that the original 830 owners are not included in these events. We were the early adopter and paid as much for our machines. 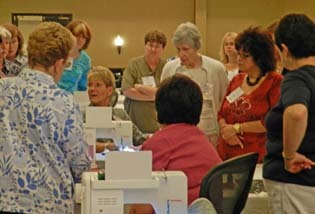 Hi Karen — Thank you for your e-mail and your interest in the BERNINA 830LE Retreat. Like retailers all across the country, BERNINA extends “limited time offers” with restrictions to consumers. While we realize that each of these offers will not time perfectly for all of our loyalists, our experience has been that they are varied enough to be met positively and with enthusiasm by most. When introducing a new product we often make a special event available to consumers. For the original 830 machine, consumers had an opportunity to join us in Kansas City with Alex Anderson for the unveiling! Our artista 730 owners had the chance to attend a VIP event as well. We regret that you were unable to particpate in one of our previous events for consumers, but you may be interested in attending one of our spectacular Software Extravaganza events hosted in Chicagoland. 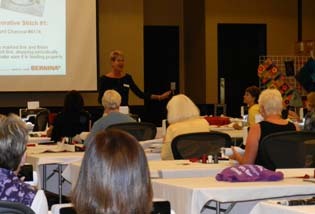 These great events with BERNINA Educators are open to all BERNINA Embroidery Software 6 owners! Watch http://www.berninausa.com for upcoming details. Again, we appreciate hearing from you and thank you for being a BERNINA loyalist! I tend to agree with Karen, though I understand the need for the limited time offers from a sales and marketing perspective. I was very frustrated earlier this year when 830s were offered with a quilt frame and the Quilt Motion software as a special offer. Perhaps offering the special add ons to existing owners of these top of the line machines at a deep discount would be a way to still sweeten the pot for potential buyers without alienating the loyalists. As both an 830 and a Software 6 owner, I look forward to the info on the extravaganza!